The West Coast Trail, named the world's best hike by besthike.com, offers a window into Canada's glorious wilderness. This trail is not for the unadventurous or unfit, but most backpackers finish the 5 to 7 day hike. If this sounds like too much work, there are plenty of easier ways to experience BC's glorious coastline and open spaces. Sign up for a kayaking tour in Vancouver or a zipline adventure in Victoria. Then be sure to visit Granville Island or join a food tour in Vancouver, known for its outstanding and multicultural culinary scene. 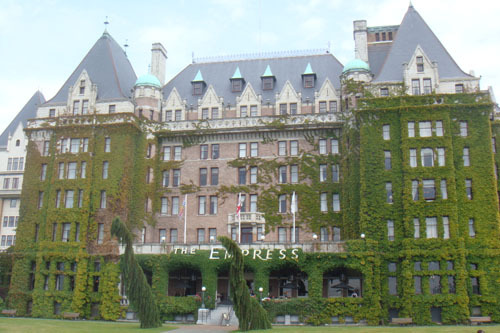 For a genteel experience harking back to the past, sip on tea and enjoy the architectural splendor of the Empress Hotel in Victoria. World class museums in both cities add to the visitor experience. 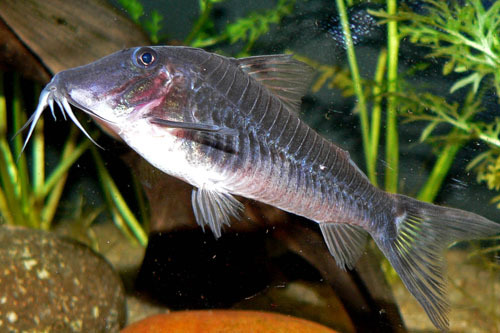 One of North America's best, this aquarium stands among Canada's top tourist attractions. A bronze orca by Haida artist Bill Reid greets visitors to this Stanley Park complex. Inside are about 65,000 critters from 400 species, including dolphins, octopuses, sloths, sea turtles and orcas (killer whales). Book ahead for adventures like a beluga whale encounter or sea lion trainer tour. The Amazon Gallery, a tropical rainforest display, is also a draw. Entry free with a Vancouver card. Extended opening hours in the summer. Railtown is arguably Vancouverâ€™s hottest neighborhood with great galleries, boutiques, bars and, of course, restaurants. This 2-hour guided tour takes you to cafes, restaurants and even an urban winery for upwards of 10 samples of food and drinks. Your small group, limited to 12 people, will learn the history and recent renewal of the area from a food-loving guide. Railtown might be one of Vancouverâ€™s best-kept secrets. The neighborhood, which until recently was an industrial part of town just east of trendy Gastown, has quickly become one of the hippest places to eat, drink and be merry. Affordable rent has attracted artists and young tech-minded professionals here, and with them galleries, cafes, bars and restaurants. This 2-hour tour takes your small group to a handful of the best restaurant and drink spots that the neighborhood has to offer, all within a one-mile (2 km) radius, and you get to sample up to 10 different foods and beverages. Start with comfort food at H.A.V.E. CafÃ©, a cool culinary training center that helps disadvantaged folks find jobs in the food industry. (Proceeds from the price of this tour actually go to this nonprofit.) You'll want to save some room for sandwiches at Big Louâ€™s Butcher Shop; light snacks on a visit to the funky Railtown CafÃ©; and two tastings of Vancouver Urban Winery's varieties during a tour inside a converted warehouse. Like any good ending, sweets are the final stop with dessert at the Cadeaux Bakery. Vancouverâ€™s skyline and wildlife come together for your viewing pleasure during this guided kayaking tour. Take a few hours to explore the inlet of False Creek, sharing the waterway with seals, ducks and kingfishers as you paddle. High rises, Science World and BC Place Stadium provide a dramatic backdrop in the early morning or at sunset, the two times you can choose to take this peaceful kayak excursion. Head to the base camp at the north end of Kitsilano Beach to begin your kayaking tour. Choose between a morning journey or paddle off at sunset, ideal times in the day when you can enjoy calm waters and less boat traffic. Receive a safety briefing from your expert guide, then slip on a vest and learn basic paddling techniques. Once you're ready, take a single or double kayak into the English Bay and follow your guide into False Creek, an inlet dividing Vancouverâ€™s downtown area from the rest of the city, and site of the Expo â€™86 Worldâ€™s Fair. As you paddle along, pass floating homes and marinas, and marvel at the wildlife, including harbor seals, herons, cormorants, kingfishers and owls. As you travel eastward, see the bridges of Burrard, Cambie and Granville. Check out waterfront landmarks like Science World at Telus World of Science, its multifaceted sphere resembling the one at Epcot Center, and BC Place Stadium. Listen to Vancouver history from your guide and gain insight into the cityâ€™s latest ventures. If youâ€™re kayaking at sunset, admire the brilliant golds and oranges illuminating the sky and the water. Paddle your way back to Kitsilano Beach, where your tour ends. Rising 230 feet above the Capilano River, the suspension bridge, built in 1889, offers a quick thrill as you bounce and venture across 450 feet to the other side. This is definitely on the must-do list for most visitors to the area, and the park now offers a new attraction, the Cliffwalk, which is a walkway clinging to the granite cliffside of Capilano Canyon. Guided nature tours, a living forest exhibit of the rainforest ecosystem and a Rainforest Explorer program for kids, makes this an informative and active day for the entire family. Hours vary slightly by month, check the website before visiting the site. A free shuttle offers rides from various locations in downtown Vancouver (including Canada Place) to and from the bridge, which is just 10 mins away. Check the website for schedules. From the airport: Direct Canada Line train to Vancouver City Centre Station followed by a short walk to Canada Place to the free shuttle. Vancouverâ€™s top sights are all mapped out for you to explore at your own pace with this hop-on hop-off trolley tour. Hop aboard a San Francisco-style trolley and listen to live commentary as you pass 34 sites, including Stanley Park, Granville Island and Gastown. Your ticket can be used over two consecutive days. Take the entire tour in 2.5 hours or hop off the trolley to sightsee, shop or dine out. For stunning city panoramas, upgrade and add entry to Vancouver Lookout at Harbour Centre. Both routes begin at Canada Place, a convention center built for Expo â€™86. The Green Route then travels through West End before winding through Stanley Park, 1,000 acres (400 hectares) of natural oasis. Inside the park, hop out at Brockton Point, fine examples of First Nation art, or at Prospect Point, the parkâ€™s highest vantage point for views of the Cascade Mountains and the green-tinged Lions Gate Bridge. After the park, the Green Route trolley swings by the English Bay and False Creek Ferries. Prefer museums and city scenes? Then plan your day around the Red Loop. See the 19th-century buildings of Gastown, Vancouverâ€™s historic cobblestoned district, and check out the vibrant district of Chinatown. Take a shopping break or grab a bite in the stylish district of Yaletown, full of boutiques and local eateries. Or spend your lunch hour at Granville Islandâ€™s Public Market, where youâ€™ll discover colorful stalls of baked goods, seafood, art and music. A walking tour of the island is included with your trolley ticket. Upgrade your introduction to the city with a glass-elevator ride at Vancouver Lookout. Ascend 554 feet (169 meters) in 40 seconds and walk around the observation deck overlooking Vancouver, the ocean, the North Shore Mountains and Olympic Peninsula. Your ticket is valid for a full day so you can return in the evening to see the city illuminated at night. Probably the best way to reach the Granville Island Public Market is by ferry. Whether you come directly across from the north shore of English Bay or from one of the half dozen ferry docks located along False Creek, arriving on the island by boat affords you a real sense of the island’s transformation from a gritty industrial backwater to an urban hub of shopping, art and entertainment. As your ferry passes under the Granville Street Bridge you can’t help but notice the imposing concrete silos of the Ocean Concrete Company plant. As Granville Island’s oldest, since 1917, and largest tenant, Ocean Concrete is a reminder of the island’s early industrial days. The island’s first industrial tenant, BC Equipment Ltd., built a corrugated tin clad wood frame machine shop near the west end of the island that now houses part of the Public Market. 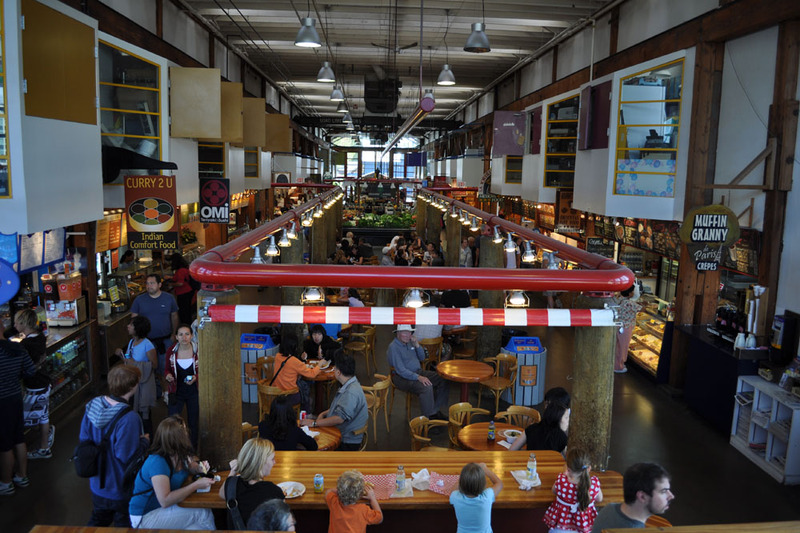 You’ll still see the exposed heavy wooden beams and hoists for moving equipment among the 50 permanent shops and more than 100 rotating booths and carts at the market. There are vendors selling everything from fresh seafood to fine jewelry and many shops specializing in hard to find ingredients for exotic ethnic cooking. Some of the city’s top chefs stop by to pick up their secret ingredients. While the market is an important source of food staples for local residents, particularly foodies, you’ll find plenty of tasty lunch and snack opportunities for the casual tourist. Shops selling fudge, stone oven baked cookies, Thai cuisine and soup-to-go stand shoulder to shoulder with vendors selling fresh made sausage, bulk grains and fresh cut flowers. 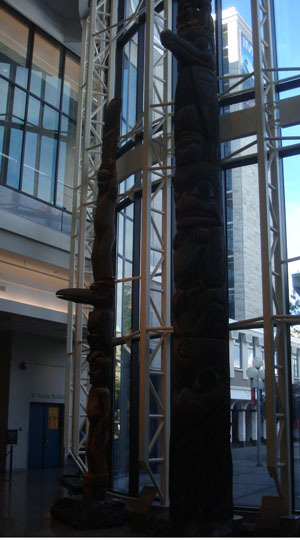 Totem poles soar in the serene central hall and the grounds, beside two Haida houses. The University serves up a world-class museum – far and away the city's best – with 535,000 ethnographic and archaeological objects. The highlight is Bill Reid's massive sculpture The Raven and the First Men. The trickster god releases people into the world; the figure turning tail and fleeing back is the artist's self-portrait. See it all soon: debate ensues about preservation of the carvings, which traditionally would be allowed to decay back into the earth. The spectacular site overlooks both mountains and sea. Wreck Beach, below, is famous for nudism and herons (http://www.wreckbeach.org). An excellent audio guide rents for $5. The museum waives its fee Tuesdays from 17:00-21:00 suggested $5 per person). Built by a successful merchant at the turn of the century, these gardens are now one of Victoria’s top attractions. 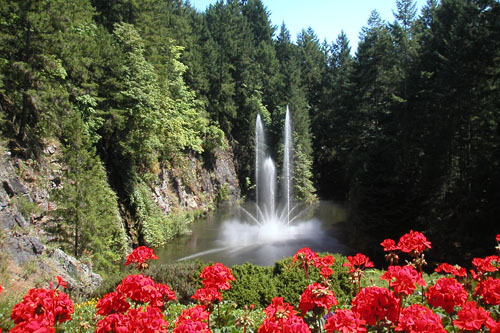 In 2006, Butchart Gardens was officially recognized as a national historic site in Canada. There’s always something in bloom, with a profusion of color in every season. Summer brings fireworks and outdoor concerts, as well as the opportunity to explore Tod Inlet in an electric boat. This is not an inexpensive excursion; if possible, plan on a leisurely visit instead of adding too many other activities to the day. Can be packed on nice days in summer, try to arrive early or late during the peak season.Check closing times as it varies every month.Groups get a discounted rate for tickets. There was a time when this spectacular museum was free, but its popularity and the increasing number of visitors to Victoria have changed the economics and this is now quite a pricey attraction. A high ceilinged interior provides the perfect venue for elaborating on the history of the local Indians, who were among the most prosperous on the continent. 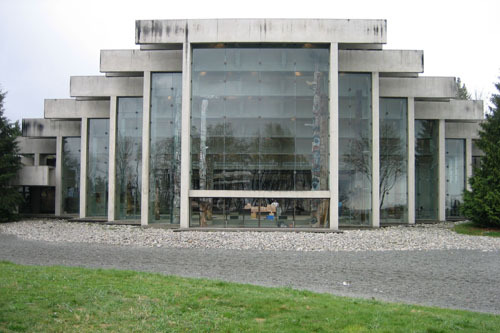 This prosperity resulted in more artwork and artifacts, and the totem poles are some of the most well preserved and impressive pieces of Indian art in the Northwest.This is a terrific place to explore the ethnic history of the area. The Natural History galley also has educational exhibits on the evolution of our planet, as well as the earth’s climates and climate change. Striving for excellence in sustainability initiatives, the museum is a bottled water free zone, practices extensive recycling and incorporates high efficiency lighting, among its many best practices. A visit to Victoria is not complete without experiencing the famed high tea at the Empress Hotel (now a Fairmont property). Guests can choose from several seatings throughout the afternoon, and enjoy a delectable assortment of finger sandwiches, pastries and scones with clotted cream, all served with an assortment of premium teas. Enjoy the opulent surroundings and experience the good life, if only for an hour or two. Seatings are at 12.30 p.m, 2.00 p.m. and 3.30 p.m.
Saltspring Island is a special place frequented by visitors from Vancouver, Victoria, Seattle, the surrounding Gulf Islands, and around the world. Check the BC ferries schedule before heading over - you only pay one way and you can walk, bike or drive on. You can also use the ferries to island hop around the Gulf. Saltspring Island boasts many vineyards and farms, which make it a popular destination for agritourism. The island is home to a very active and vibrant community of artists, musicians, farmers, professionals and young families and hosts many exciting events year-round, including music, food and art festivals. Ganges - the main town - offers every service and amenity you could ask for and there are inns, b&bs, resorts, and fine dining restaurants tucked away all over the island. Be prepared to encounter pocket markets along side roads - bring change with you to purchase firewood, jam, flowers, vegetables, eggs, seeds and more goodies discovered at roadside. Pack your hiking shoes and climb nearby Mt. Maxwell for a spectacular view of the island and surrounding waters. The Treehouse Cafe in Ganges is a popular spot that serves great food, and coffee and hosts live music on summer evenings. The Saturday market is hugely popular and reason enough alone to make a trip to the island. Its stalls offer up an abundance of local food, wine, crafts, pottery, books, clothing and much more. 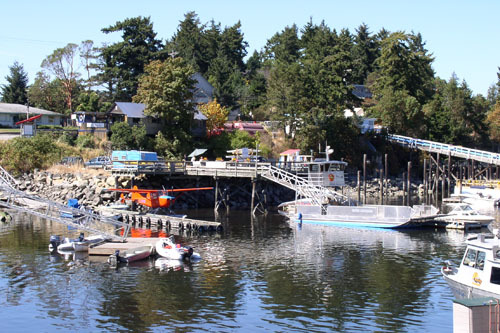 Short ferry ride from Vancouver or Swartz Bay north of Victoria. 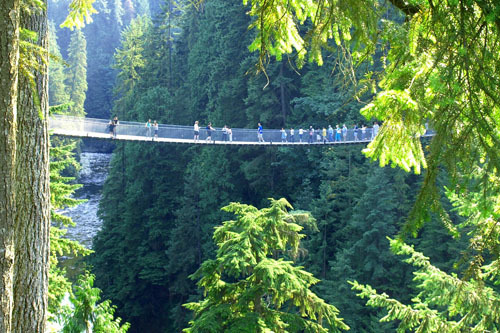 Feel like an eagle as you soar through British Columbia's temperate rainforest! Located on Vancouver Island, just 30 minutes outside of central Victoria, the zipline park is home to eight exhilarating ziplines covering more than 1,000 feet (305 meters). Your tour also includes a 10-minute ATV ride and two suspension bridges that will have you walking high above the forest floor. This small-group two-hour comes with not one, but two tour guides who will tell you about the surroundings, answer your questions and ensure that your experience is safe and fun! Fly over the majestic Pacific Coast rainforest on this small-group zipline adventure located just outside of Victoria on Vancouver Island. During this exhilarating ride through the trees, youâ€™ll fly at a speed of nearly 40 mph (60 kmh) as you soar 150 feet (46 meters) off the ground on eight scenic ziplines ranging in length from 150 feet (46 meters) to an unforgettable 1,000 feet (305 meters ). When you first arrive, you will be fitted for your harness and lead on a practice zipline run. Once you've completed the practice zipline, you'll hop onto an ATV for a ride up the mountain. From the launch point, youâ€™ll get back down to the bottom of the mountain on the eight ziplines. Youâ€™ll also have the chance to walk across two impressive suspension bridges that will give you a fantastic perspective on the rainforest. Your two professionally trained guides emphasize safety and comfort, ensuring a ride full of thrills, natural beauty and wonderful memories. As you make your way through the forest and over British Columbiaâ€™s picturesque Sooke Hills, your guides will provide you with interesting facts and stories about the local ecology and wildlife of Canada.